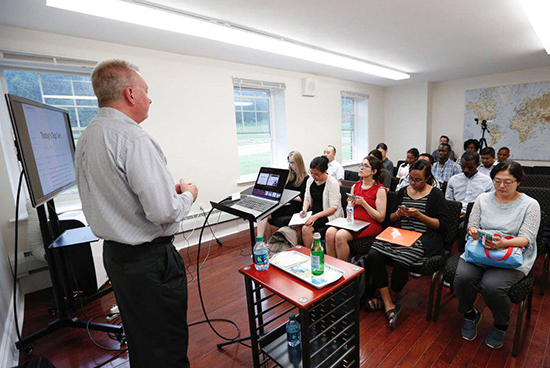 Earlier this month, the World Evangelical Alliance (WEA) kicked off the pilot run of its Fellowship of Emerging Leaders (FEL) program hosted at the Evangelical Center in Dover, New York. 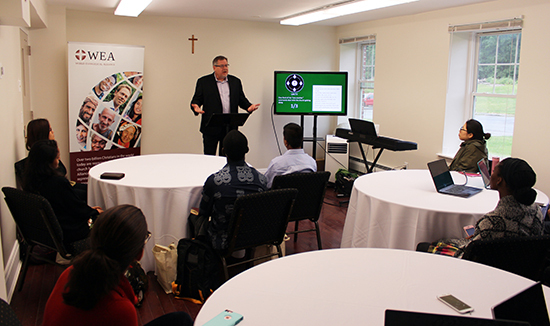 The 12-week program that runs from June 6 to August 25 will equip younger leaders from different countries to serve more effectively in their respective National Evangelical Alliances. It is a unique opportunity for them to capture a global vision of the Evangelical Alliance and its transforming impact at the local level. This year’s FEL participants have come from Burkina Faso, Ghana, Guinea, Madagascar, Myanmar, and Sri Lanka, with two more still expected to arrive from India and Pakistan. Together with New York-based WEA staff who are themselves all from different nations, they will make up an international group coming from 14 countries. 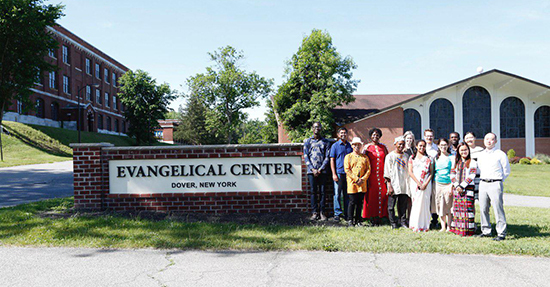 FEL participants with WEA staff at the Evangelical Center in Dover, upstate NY. The FEL program features lectures by experienced Alliance leaders and others who contribute their insights into what it takes to be an effective leader. Participants also serve as interns within one of the different departments of the WEA, such as Alliance Development, Public Engagement, Admin & Finance, Communications & Membership where they gain hands-on experience working alongside WEA leaders and staff. They also have an opportunity on two afternoons to work in small teams on projects of their choice that aim to serve the Evangelical Alliances in their respective countries. The first lecture on "The Leader as a Life-Long Learner" was delivered by Dr. Ralph Enlow, President of the Association for Biblical Higher Education (ABHE). Also part of the program are several exposures that are planned to New York, the United Nations Headquarters, and a three day trip to Washington D.C. which includes visiting the office of the National Association of Evangelicals and the Christian Media Corporation where they will receive media training, among other highlights. Spiritual formation is another important aspect of the FEL program, with devotions each morning and prayer times to support each other and pray for current global issues, such as this week's World Refugee Day. Dr. Rob Brynjolfson's message at the FEL opening service titled 'One Another' focused on the community aspect of the onsite training program, which will become a valuable experience for life. To learn more about the Fellowship of Emerging Leaders program, visit wea-fellowship.org. Also follow the FEL2017 Facebook page to see news & pictures and get a taste of the participants’ experience!